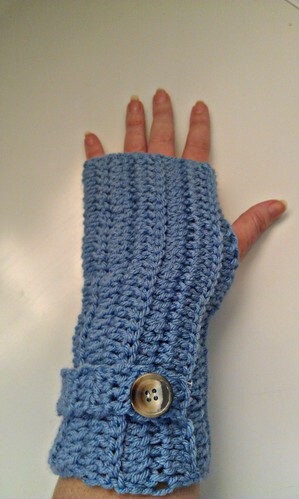 A fun crochet accessory that many seem to really like are fingerless gloves. There are oodles and oodles of styles out there. Some are thick and warm while others are lacy and stylish. 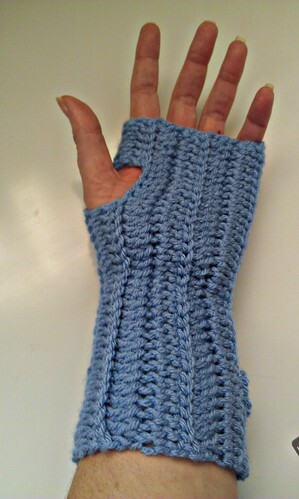 I decided to try out making a set of fingerless gloves and I chose the pattern Ribbed Crochet Wrist Warmers. 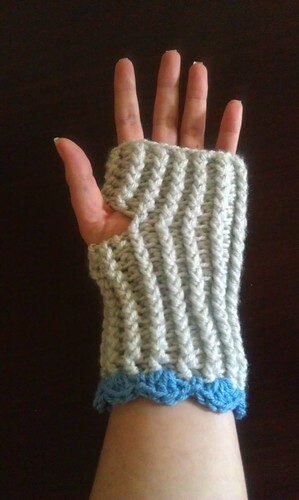 The gloves use a Front-Post and Back-Post double crochet stitch, which is a stepping stone to learning to do cable crochet. 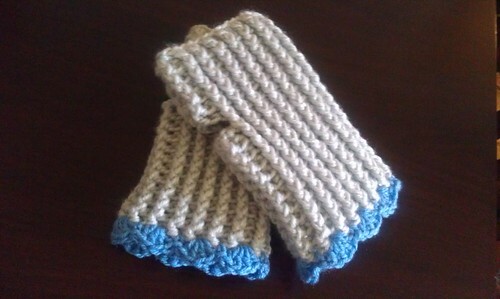 These gloves are made starting by making a loop, then crocheting around and around to the length desired. 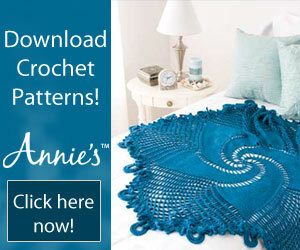 I used a bit thicker yarn than the pattern designer so mine turned out to be quite thick! 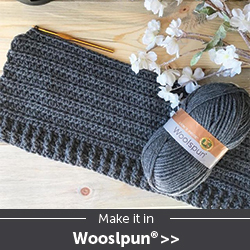 I'm sure if I use a thinner weight yarn, like Caron Simply Soft, they would turn out thinner even with the Front Post and Back Post double crochets. 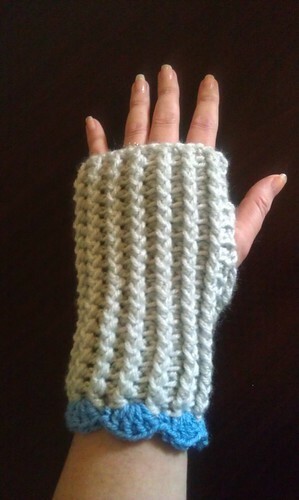 I then decided I would try my hand at making my OWN fingerless gloves crochet pattern! So I searched around at more photos online then settled upon making ones that are made length-wise. While it looks a little thick in the photos, it isn't as thick as the ribbed set I made before. They are thin but not too thin. I used Hobby Lobby "I Love This Yarn" for both sets. I also decided to add a little embellishment to them- a strap with a button! It's nonfunctional but still cute! Here's my pattern! It's super easy even for beginners! 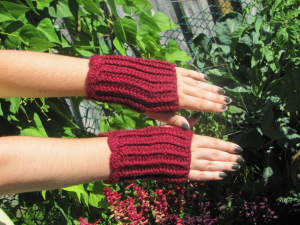 Basic Crochet Fingerless Gloves Pattern :Materials: H 5mm Crochet Hook 120 Yards of your favorite yarn Large yarn needle Sharp scissors Two buttons :Pattern: ch 33 1- dc in 3rd ch from hook and across. ch 3, turn. 2- dc in back-loops-only across the row. Ch 3, turn. Repeat this step 3 more times. 6- dc in BLO in next 5 dc, ch 4, sk 4 ch (thumb-hole made), dc in BLO across rest of row. Ch 3, turn. Repeat row 2 six more times for a total of 12 rows. Test the wrap around your hand to see if you need to add or delete a row to fit. Close glove with sc stitches across and turn inside-out to hide the ridge inside. Weave in ends. Strap- ch 5, hdc in 3rd stitch from hook and remaining 2 stitches. ch 2 and turn. Then, hdc in the stitch immediately below the chain 2 and in remaining hdcs, leave tch unworked. Continue second row 7 more times. Tie off and weave ends. Sew your button on the end, then sew your strap to your glove. Note- Remember to put the straps on opposite sides of each other on the gloves, you don't want TWO left-handed gloves! Yes, I did make that mistake with my first pair! 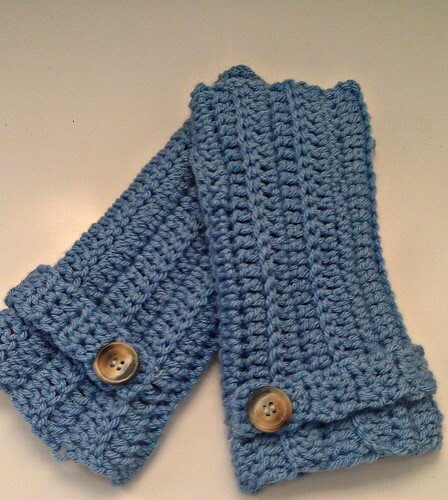 :) Enjoy your new crochet fingerless gloves and I hope this inspires you to find and do more crochet!